- Mixed Unity, a youth group founded in response to the murder of Blair High student Tai Lam last fall, is hosting its first annual Youth Peace Summit on Saturday. All members of the community are invited to hear motivational speakers and attend workshops on gang violence, domestic violence and genocide. The goal of the meeting is to create an action plan for tackling violence locally and elsewhere. The summit is from 9am to 5:30pm at at Montgomery College's Takoma Park-Silver Spring campus. - District 4 Councilmember Nancy Navarro talks about her life and new position in the Post Magazine last week. We're not quite sure what she means by saying that "disparities" is the biggest issue she faces as an elected official. Does she mean income disparities? Health care disparities? Deliciousness disparities between chicken from El Pollo Rico and Pollo Sabroso? It's way too vague. - From the listservs: The MTA's written a white paper discussing the benefits of a future Purple Line station at Wayne Avenue and Dale Drive, but neighbors who saw it at a presentation last month are still skeptical. MTA argues that removing the stop would make it harder for residents to use the proposed transitway between Bethesda and New Carrollton, though some community members fear it'll be a catalyst for higher-density redevelopment in their neighborhoods. - Looks like The Kids are really getting into Fenton Street Market. local resident Alison Rice profiles several young people who sold crafts there, while Jerry McCoy from the Historical Society gets some high schoolers interested in neighborhood history. 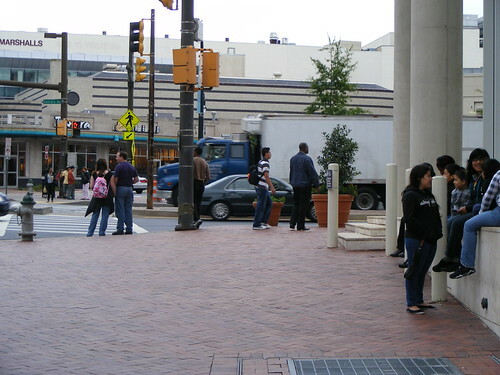 Will it be too long before we have to worry about rowdy flea-market-related teen behavior in Downtown Silver Spring? The Purple Line Dale Drive white paper makes a reasonable case for having a station at Dale Drive based only on transit considerations, but it does not consider the effects on the neighborhood other than transit use. If the line negatively impacts the residential character of the neighborhood and leads to higher density the residents don't want, it might not be good to have the station even if it benefits transit use. More transit use needs to be balanced with other considerations. The most interesting thing in the study is that most of the use of a Dale Drive station would come from residents the area south of Wayne Avenue. Maybe the "No Train on Wayne" folks were right and the line ought to use one of the alternative routes farther south where the users are concentrated. Has the lesson of no metro station in Georgetown been lost on these folks? On a related transit issue, Dan I hope you will be at the Q2 hearing next Tuesday. Also hoping my elected officials come out too. I'm going to be LIVID if they propose a broken line forcing us downcounty-residents to make yet another transfer to get upcounty. There had BETTER be an express alternative proposed. The Forest Glen Metro Station has a lesson for us too. The density did NOT increase around that station, even though it is a heavy rail station. That is because the zoning at Forest Glen did not change. Density will not increase around a Dale Drive light rail station if the zoning is not changed. Wayne and Dale isn't like Georgetown, and in fact, I think people would be pretty upset by that comparison. I do think Forest Glen is a fitting analogy, though. Wayne and Dale is not and has not been the kind of major node where redevelopment would be justified. The Purple Line works because it connects all these residential neighborhoods not currently on Metro lines to job centers. There will be many Purple Line stops where major TOD will not happen or, if it does, will happen at a very small scale - Lyttonsville, 16th Street, Manchester Road and Gilbert Street all come to mind. Transit stations can exist in residential settings like these without major redevelopment.